The Occupational Safety and Health Administration (OSHA) has adopted the Globally Harmonized System (GHS) for classification and labeling of hazardous chemicals. The GHS chemical container label is designed to ensure that workers understand the specific hazards related to the chemicals used or handled and the specific protective measures required to avoid adverse effects. The Research Laboratory & Safety Services (RLSS) User Dashboard provides GHS labels, in different sizes, for every chemical documented within the laboratories online inventory. After June 1, 2015, every hazardous chemical in a laboratory must be labeled with a GHS-compliant label. Therefore, laboratories will need to replace obsolete labels on their existing chemical containers with a GHS-compliant label. This reference guide will help you understand how to create a GHS-compliant hazardous chemical label. All of the required information to create a GHS chemical label may be found on the product’s GHS Safety Data Sheet (SDS). 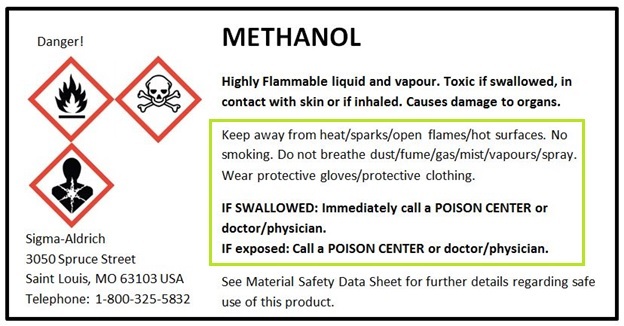 A Material Safety Data Sheet (MSDS) may not contain all of the required information for a GHS label, as the new SDSs contain additional information. If all you have is an MSDS, contact the manufacturer or Research Laboratory & Safety Services (RLSS) to obtain any missing information. If you create novel chemicals in your laboratory, you are required to complete a GHS-compliant container label for each novel chemical. Contact RLSS for more information on how to fulfill these requirements. The label components detailed in this guide are required for all containers of hazardous chemicals; however additional supplementary information may be provided by the manufacturer or supplier on the label. There is no set format for a GHS-compliant label, as long as all required components are present and the label is printed in color. Labels must be large enough for the writing to be legible. This guide uses the RLSS-recommended format for GHS-compliant labels. The product identifier is most often the common product name of the chemical, and must match the product identifier on the SDS. 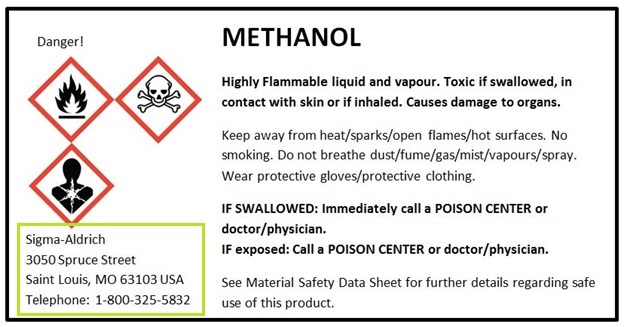 The product identifier for Methanol is “Methanol.” The GHS-compliant label for mixtures must include all components of the mixture with their relative percentages. 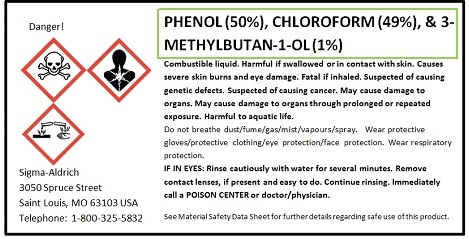 The product identifier for the Phenol, Chloroform & 3-methylbutan-1-ol mixture is “Phenol (50%), Chloroform (49%) & 3-methylbutan-1-ol (1%).” The product identifiers in the examples below are highlighted by the green box. A GHS hazard pictogram consists of a black and white symbol surrounded by a red diamond. The hazard pictograms applicable to your chemical must be printed on the label in color. These pictograms are meant to warn hazardous chemical users about the potential hazards of the chemical. 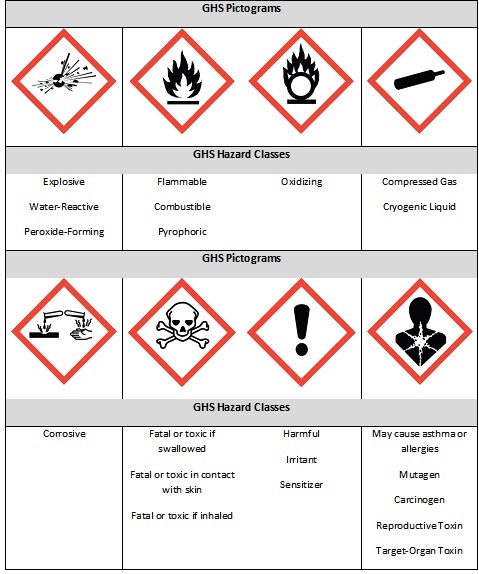 The nine GHS pictograms seen below and the hazard class(es) (e.g. Explosive, Corrosive) that they refer to may be included on the chemical label, depending on information provided in the SDS. For mixtures of hazardous chemicals that are not assessed by the manufacturer as a whole, the individual hazards and pictograms will be included on the GHS label for all of the components., If two chemicals in a mixture require different GHS pictograms in the same hazard class, the more severe of the two are used in the mixture’s label, and the less severe is omitted. For example, Category 1, 2, and 3 in the “Acute Toxicity” GHS hazard class requires the skull and crossbones pictogram while Category 4 in the same GHS hazard class requires the exclamation mark pictogram. Therefore, if a mixture of hazardous chemicals includes a chemical that is fatal if inhaled (Category 1, 2 and 3) and a chemical that is harmful if swallowed (Category 4), only the skull and crossbones pictogram must be appear on the label. More information on this hierarchy can be found in the Reference Guide to GHS Hierarchy. 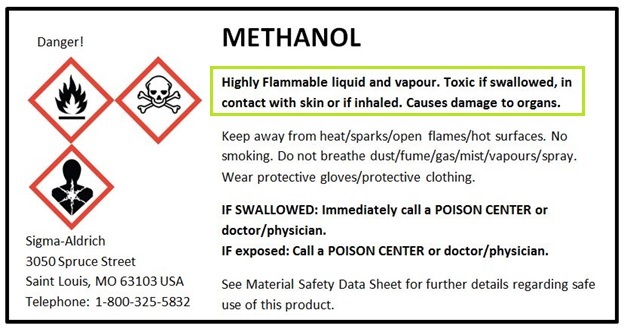 Based on its SDS, a container of Methanol must have the GHS pictograms for “Flammable,” “Fatal or Toxic if swallowed, in contact with skin or if inhaled,” and “Target-Organ Toxin” printed on its label. Based on their SDSs, the Phenol, Chloroform & 3-methylbutan-1-ol mixture must have the GHS pictograms for “Fatal or Toxic if swallowed, in contact with skin or if inhaled,” “Target-Organ Toxin,” and “Corrosive” printed on its label. These pictograms are highlighted in the examples below by the green box. A signal word is used to indicate the severity of the hazards presented by the chemical (i.e. "Danger," "Warning"). "Danger" indicates a more consequential hazard than "Warning." The signal word for each hazardous chemical can be found on the SDS and must be placed on the label. 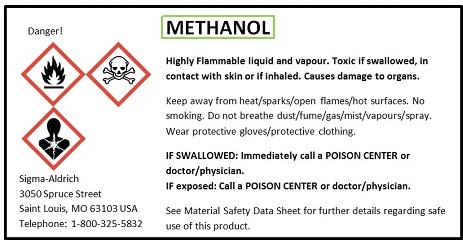 Labels for mixtures of hazardous chemicals must include the more severe signal word (e.g., if a one chemical requires "Danger" and another requires "Warning," "Danger" is used as the signal word for the mixture). Based on relevant SDSs, both the container labels for Methanol and the Phenol, Chloroform & 3-methylbutan-1-ol mixture must use "Danger" for the signal word, as highlighted below by the green box. A hazard statement is a standardized GHS phrase assigned to chemicals that describes the nature and degree of the hazard(s) associated with that chemical. Every applicable hazard statement from the SDS must be included on the container label. A full list of GHS hazard statements is available on OSHA’s website. A precautionary statement is a standardized GHS phrase that describes the required protective measures that must be taken to prevent exposure or minimize adverse effects from exposure to the hazardous chemical. Precautionary statements are directly related to the hazard statements assigned to a chemical class (e.g. a hazardous chemical that includes “Fatal if inhaled” as a hazard statement will have “Do not breathe dust/fume/gas/mist/vapors/spray” as a precautionary statement). Every precautionary statement listed on the hazardous chemical’s SDS must be included on its container/sample label. A full list of GHS precautionary statements is available on OSHA’s website. The required precautionary statements for each example label are explained below and highlighted by the green box. Keep away from heat/sparks/open flames/hot surfaces. IF SWALLOWED: Immediately call a POISON CENTER or doctor/ physician. IF exposed: Call a POISON CENTER or doctor/ physician. Immediately call a POISON CENTER or doctor/ physician. for Approval Holders on leased (Non-UA) property, the street address must be used), and include the Approval Holder’s phone number. The supplier of Methanol and the Phenol, Chloroform & 3-methylbutan-1-ol mixture is Sigma-Aldrich, and its supplier information includes the address and telephone number for the company, which is highlighted by the green box in the examples below. If you were creating a mixture of chemicals in your laboratory, the supplier identification would include laboratory-specific information as explained above. Many companies provide label makers that comply with the GHS, as well as premade pictograms that can be affixed onto containers. Some companies also provide appropriately labeled secondary containers, such as squirt bottles for ethanol and acetone. Additionally, many companies have started to produce fillable GHS label templates, or premade GHS-compliant labels at no cost (e.g. SmartSign). For more information on commonly purchased items, such as pre-labeled squirt bottles, see the Common Purchase List. 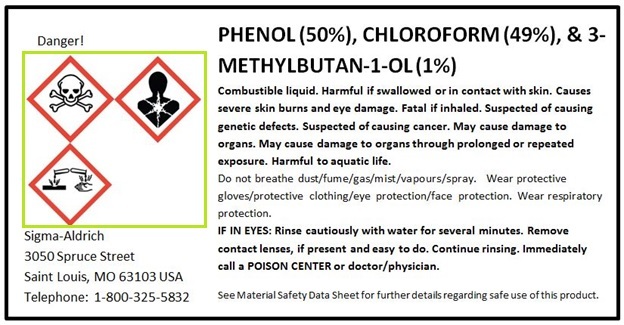 For more information on container labels, contact Research Laboratory & Safety Services at (520) 626-6850 or rlss-chem-support@email.arizona.edu.